People have been talking about “disruptive innovation” for a long time. According to Clayton Christensen, disruptive innovations are those that produce a rupture in a company’s traditional business model. One of the most cited examples of disruptive innovation, one that is always brought up, is Steve Jobs’ replacing the keyboard on cell phones with a screen that not only displayed images in high definition, but also responded to the user’s touch-commands. According to Clayton Christensen, there are two types of innovation: sustaining and disruptive. An innovation can be considered sustaining when it uses a technology that results in a superior product or service. Disruptive innovation, on the other hand, follows a different logic. Whereas conventional companies seek to improve their products and services to satisfy it’s most demanding customers and those with the most purchasing power, companies guided by innovation and opportunity invest in the two market segments considered to be least profitable: new customers and those with the least purchasing power. The disruption in this case happens when companies focus on providing these consumers with a satisfactory product at a price below that of their competitors. In the process, they develop hitherto unexplored niches in a variety of areas. Disruptive innovation, therefore, should lead to a rupture in both logic and business models. As Clayton explains, it is in the breaking open of new markets that companies compete for non-consumers, i.e., by offering their product, often of inferior quality but at an affordable price point, to people who were not consumers previously. However, disruptive innovation alone is insufficient; it is crucial to have a disruptive strategy to support it. Business challenges stemming from constant environmental change can quickly render conventional strategies outdated. A disruptive strategy is one that supports the development of a product or service that establishes a new market and destabilizes dominant competitors. Companies commonly adopt the strategy of offering a simpler, cheaper version of what already exists, or something that serves a customer who previously had no access to the market. 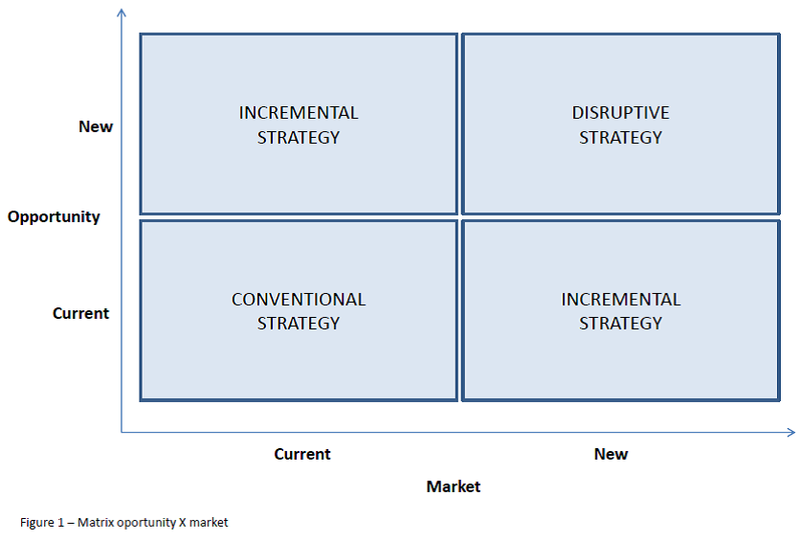 In Figure 1 we can see what differentiates the disruptive strategy approach from that of conventional or incremental strategies. When in the current market we have the standard opportunities, a conventional strategy is enough. Incremental strategies are appropriate when we have new opportunities in the current market, or standard opportunities in a new market. When we face the challenge of new opportunities in new markets, disruptive strategies are called for. These strategies are presented in the Opportunity x Market matrix in Figure 1. The time to develop a disruptive strategy is as soon as an opportunity to use one is identified. Think of arenas, not sectors. Adopt metrics that sustain entrepreneurial growth. Focus on experiments and solutions to problems. Establish strong relationships and networks. Avoid radical restructuring; know when to retreat. In the initial stages of innovation, be systematic. Experiment, promote interaction, and learn. Was this clear? Are you ready to develop and implement disruptive strategies? Is Your Business Model Disruptive? When is an Ambidextrous Enterprise the Solution?